Port of Los Angeles. Photo by John Schreiber. A bipartisan group of U.S. congressional representatives wrote a letter Wednesday to federal budget negotiators in support of the Ports Security Grants Program, citing the thousands of cyber intrusion attempts the Port of Los Angeles receives each month as reason for the program’s need for continued funding. Rep. Nanette Diaz Barragan, D-San Pedro, a member of the House Committee on Homeland Security, led the efforts to draft the letter signed by nine House members. She said the Trump administration has proposed cutting the program 52 percent from last year’s funding level. The cyberattack on Maersk shut down the Los Angeles Port’s APM Terminal, which the company operates, for three days last June, although the port itself and its computers were not hit in the cyber-attack and the port’s other seven terminals operated normally during the shutdown. 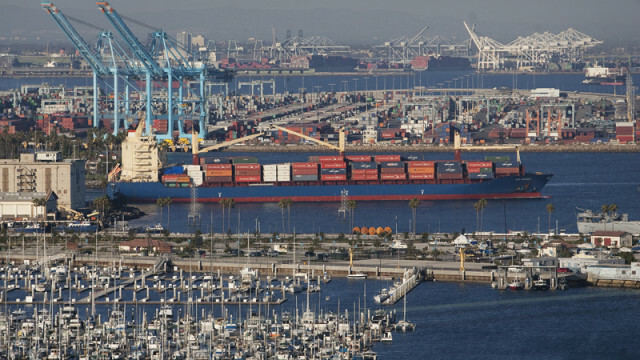 The “Petya” ransomware attack hit businesses and government agencies in at least 65 countries, including the United States, and Maerk’s operations were impacted around the globe, not just at the Port of L.A. The letter asks that funding for the program remain at a level no less than $100 million, which is equal to fiscal year 2017 funding and the fiscal year 2018 level approved by the House Appropriations Committee.